Corum is located at the intersection point of Black Sea and Central Anatolia Regions Its altitude is 770 meters. The highest mountain in Corum is Kose Mountain between Iskilip-Kargi (2.087m). The longest rivers are Kizilirmak and Cat Suyu. Although Corum is dominated by the continental climate of Central Anatolia; the softening weather of the Black Sea shows its effect to a certain extent. The former capital of Hittites, who had founded the first organized state, Hattusha is in Corum, where cultural data belonging to seven thousand years back. 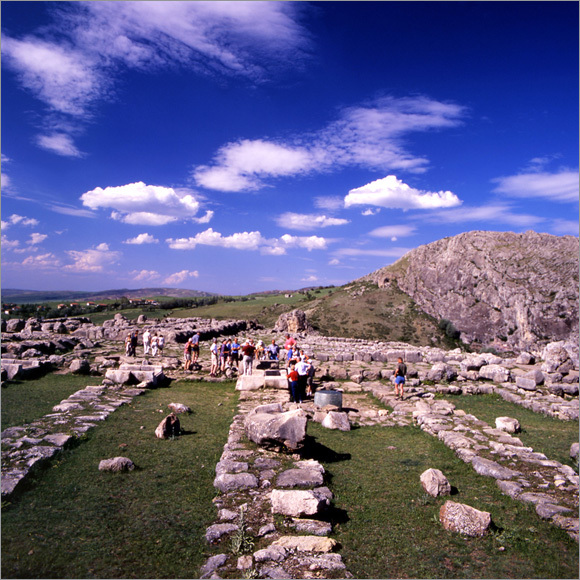 Hattusha, which lies at the heart of Anatolia, was put on the World Culture Heritage List by UNESCO. Hittite Civilization is as old and rich as Egypt Civilization. The Treaty of Kades, which was signed between Egyptians and Hittites, is the first written agreement in history. The cuneiform tablet, of this agreement was found in Bogazkoy. Alacahoyuk Ruin Place, known as Arinna in archeology, is another important cult (religious) center of Hittites, with 13 Royal Tombs, Hatti bronze Sun Course and Sphinx Gates, which is worth seeing. Apart from the traces of Hittite Civilization, Corum is adorned with bridges, mosques and castles, each of which is a work of art belonging to the time of Ottoman and Seljuk. 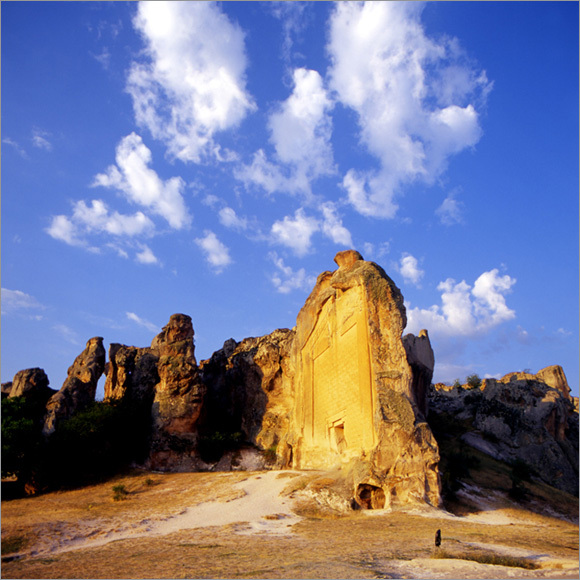 In addition to this, Corum is worth seeing with its natural beauties such as high plateaus and Incesu Canyon. Famous Corum chickpeas and rice produced in Osmancik and Kargi are world known. In the researches carried out in Corum and its surrounding the human settlement in Corum in Paleolithic Age, Neolithic Age and in the fourth period Chalcolithic Age was proved. The remnants of these Ages were found in Alacahoyuk, Buyuk (Grand) Gulluce, Bogazkoy, Eskiyapar, Kussaray. The places of settlements have shown continuity up to now. Corum and its surrounding area have been under the sovereignty of Hittite, Phrygian, Kimmer, Med, Persian, Gaul, Roman, Byzantine, Seljuk, Danishmend, Mongol, Eretna, Kadi Burhanettin and Ottoman. Corum district, which is like an open air museum due to its rich heritage, has been focus of many local and foreign science man as well as European travelers since 1830. Districts of Corum are Alaca, Bayat, Bogazkale, Dodurga, Iskilip, Kargi, Lacin, Mecitozu, Oguzlar, Ortakoy, Osmancik, Sungurlu ve Ugurludag. It is situated at 50km far from Corum. The most important historical places, which are allowed to see, are historical remnants in Eskiyapar and Mahmudiye, and ruin places full of artifacts of Hittite time in Alacahoyuk, Kalinkaya and Pazarli. Gerdekkaya (Bridal Chamber Rock) Tomb and Kochisar Cave are also favoured by tourists. Old Mosque (Eski Cami) built in city center by Omer Osman Pasha in 1763 and New Mosque (Yeni Cami) and Huseyin Gazi Tomb, both made of wood, built by Ardahan emigrant Sheik Effendi in 1893 are some of the worth seeing historical places. It is 83 kilometers far from city centre. Bogazkoy, which is situated in the district, was put in the World Culture Heritage List by UNESCO. Moreover, Yazilikaya Open-air Enshrine is one of the most significant tourist attractions. It is 113 km far from city centre. Among the historical artifacts in Kargi, Mihrihatun Mosque and Turkish bath, which were built in the name of Murat IV’s wife Mihrihatun in Karaeski Village, a mosque of Seljuks in Oghuz Village, and Hacihamza Castle and Khan are among the significant ones. The high plateaus of Kargi are also tourist attractions. Abdullah High Plateau, Kargi High Plateau, Eginonu High Plateau, Aksu, Orencik, Karaboyu, Gokcedogan High Plateaus are very suitable for high plateau tourism. Monumental Rock Tomb, Lacin Chalet House Recreational Area are worth seeing. It is 37 km far from Corum. The most important historical monument in the district is the Elvan Celebi Mosque (1352) & Dervish Lodge & Tomb and Turkish bath next to it. It is 53 km far from city centre. In Sapinuva, which was one of the important trade centers of Hittites in Ortakoy, excavations are being still conducted. In addition to this, Incesu Canyon in Incesu Village and Damlatas Cave in Asdavul Small Town are lions of the district. 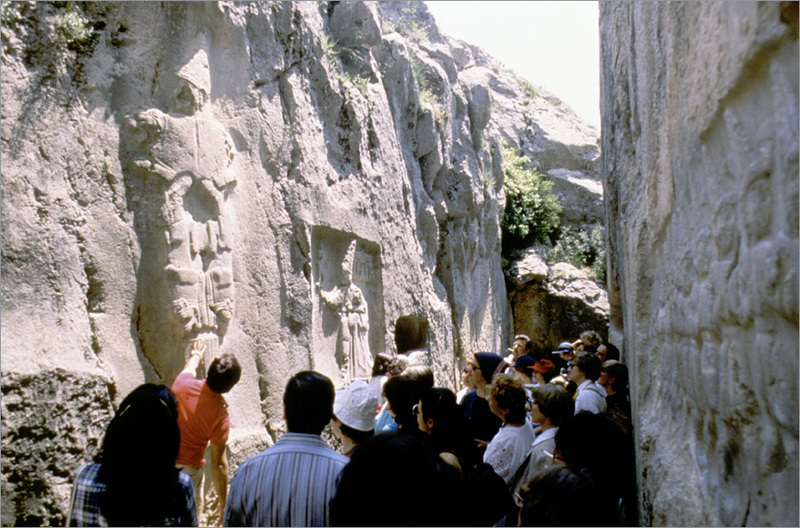 Kybele Rock Relief, on the rocks in Incesu Canyon is one of the spectacular traces. It is 56km far from city centre. Osmancik is one of the oldest districts of Corum. In Osmancik, which is located on the route of Silk Road, Koyunbaba Bridge & Tomb, Osmancik Castle, Koca (Grand) Mehmet Pasha Mosque, Baltaci Mehmet Pasha Fountain are lions of the district. 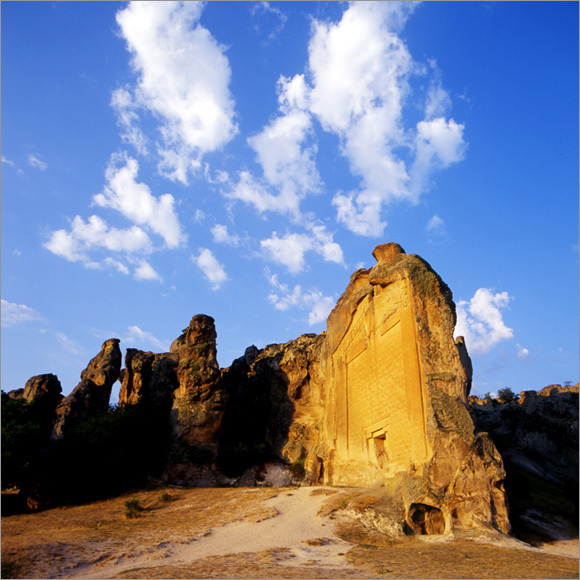 Moreover, Baspinar and Karaca High Plateaus are of important for plateau tourism. In the museum Archeological Hall, in which the historical artifacts belonging to Late Chalcolithic (4500 BC) Age and chronologically speaking Old Bronze Age, Assyrian Trade Colonies, Old Hittite, Hittite Empire, Phrygian, Hellenistic, Roman and Byzantine Ages are exhibited, and Ethnography Hall, in which the ethnographic items are exhibited, are both interesting and didactic. Alaca District is located in Alacahoyuk Town. In the museum, which furnishes services dependent on Corum Provincial Directorate of Museum, some artifacts dating back to Chalcolithic, Old Bronze Age, Hittite and Phrygian Periods and some other ethnographical items are exhibited. They are 45 km far from Corum. Being 84 km far from Corum, it is located in Bogazkale District. In the museum, which furnish services dependent on Corum Provincial Directorate of Museum, artifacts found in Bogazkoy- Hattusha Excavations and in the neighborhood are exhibited. Although artifacts belonging to Hittites are dominant in number there are also ones belonging to Chalcolithic, Old Bronze Age, Hittite, Phrygian, Roman and Byzantine periods. It is located 45 km southern of Corum and 17 km northern of Alaca District. The Tumulus (Hoyuk) was first introduced to science world by W.C HAMILTON in 1835. In Alacahoyuk, which was a significant cult and art center during Old Bronze and Hittite Periods four civilization age are recorded. Late Chalcolithic Age is followed by Old Bronze Age, Hittite, Phrygian, and Byzantine periods. 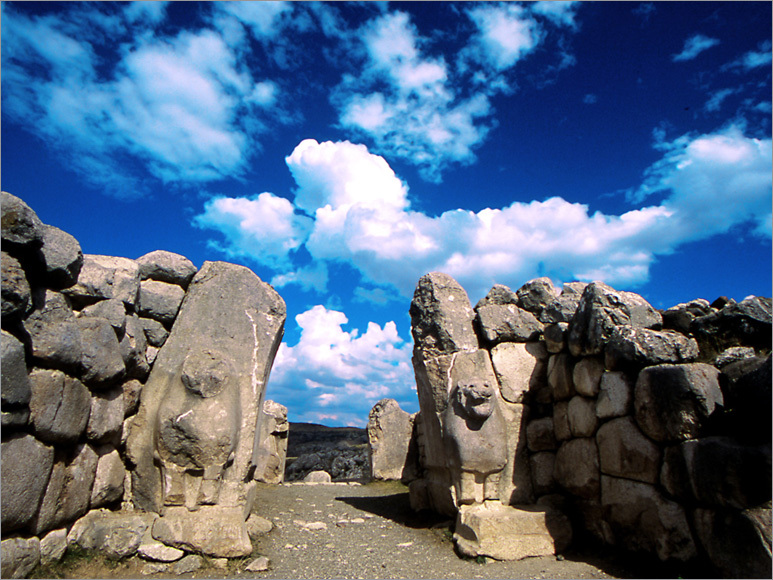 With the Sphinx Gate belonging to Hittite Empire period, Potern gate on the west and with some other architectural monuments in the tumulus, Alacahoyuk shed light on the Hittite civilization. Moreover, Old Bronze Age royal graves, some other local museums and Alacahoyuk Ruin Place are some of the ruin places the tourists can also see during their one-day visit to Bogazkoy and Yazilikaya. Dating back to Hittite empire, the width of the Sphinx Gate, which was built between two towers with andesite blocs on a limestone base, is 10 meters. The relieves in inner and outer sides of the towers reflect a cult festival celebrated in honor of the Storm God. As Alacahoyuk sheds light on the Old Bronze Age with its 13 royal (king) graves, and also on Hittite period with its architectural monuments it has a significant role in archeology literature. Bogazkoy (Hattusha) Ruin Place is located 82 km. southwest of Corum Province. 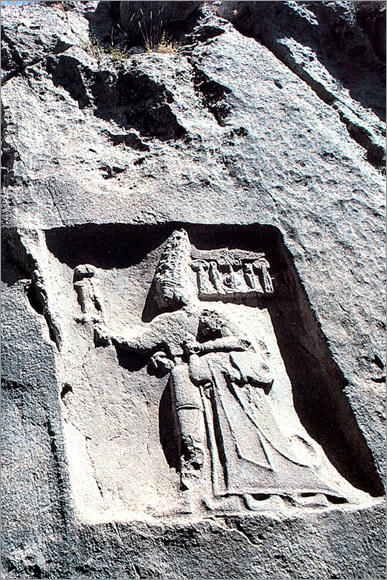 Bogazkoy (Hattusha) Ruin Place, which lies in the central core area of Hittite Empire, is surrounded by innumerable rock masses and the scattered mountain slopes 300m above the plain on the south end of Budakozu Stream, and therefore from the north and west it is limited by deep slopes. Except from the northern side, the province is surrounded by ramparts. Remnants, which come to light in the archeological excavations and which are restored, are more like an open air museum. It also becomes the focus of Historical National Park. Hattusha was included in the World Culture Heritage List by UNESCO in 1986. The excavations and researches carried out since a century proved that the earliest settlement in Hattusha-Bogazkoy was in Chalcolithic Age (6000 B.C). In Hattusha, where settled inhabitances are seen during Old Bronze Age, Assyrian Trade Colony Period comes next. According to written documents, at the beginning of 2000 B.C Anita from Kusar defeated Pijusti, the King of Hattusha and then ruins and curses the city. Despite the curse of Anita the city was selected as the capital of Hittites by the King of Hittite, Hattusili I between the years 1600-1650. As Hittites left the city due to various reasons in 1200 B.C, Early Iron Age (Dark Age) begins in the area. This period is followed by Phrygian Age in 9 B.C, Hellenistic, Galatians’ and Roman/Byzantine Ages. In this open-air temple, which is believed to be used especially during New Year celebrations in spring, there are relieves of significant gods and goddesses altogether of the country. It is 3 km to the north of Ortakoy District, which is located 53 km southeast to Corum. The city is situated on a tableland on the northern slopes of a rather deep valley. Monumental structures came into light through researches made. In these buildings, archives of Hittite cuneiform script tablets, whose total number has reached to four thousand up to now, were found. The texts written in Hittite constitute most of them Due to their content, relations, paleography and foundling states, Ortakoy Sapinuva tablets are believed to belong to the same period, and moreover due to their relations with Masat Tumulus documents these tablets are declared to be dated to the end of Middle Hittite Period. Tumulus, which is 5 km west to Alaca on Alaca-Sungurlu road, is located 25 km northeast and 20 southeast to Bogazkoy and Alacahoyuk, respectively. According to the researches done the existence of a permanent settlement was proved and some artifacts belonging to Old Bronze Age, Hittite, Phrygian, Roman, and two-term Hellenistic periods were found. From the blasted houses in the neighborhood of Hittite Period, which lies on a vast area on the southeast of the tumulus, a number of earth artifacts were taken out. Again the cult vases with relieves found in the area strengthen the idea that the district has been a religious centre then. In the tumulus during the researches done in the layer of Old Bronze Age, which are below the layers of Hittite period, a treasure composed of silver and golden objects were found on the base of a house. The treasure composed of silver vases, Syrian bottle, silver ceremony ax, golden needles, beads, earrings and bracelets of various kinds, resembles the foundlings in both Alacahoyuk and Kultepe and also in Truva, Poliochni and North Syria-Mesopotamia, which are displayed in Ankara Museum of Anatolian Civilizations. Sungurlu District, Yoruklu Town is located in the area which is called Huseyindede (Grandfather Huseyin) Hill. As a result of the researches done two separate pieces of a vase with relief and a one-room house belonging to Old Hittite period were encountered. Following the restoration work of these pieces it was determined that one of them was a kind of Inandik Vases and the other was smaller and on the neck there was a band describing religious ceremonies of Hittites. The most significant scene on this line of description is an acrobat tumbling on a bull. On the vase similar to the kind of Inandik Vase there are four description bands and on the mouth part of it there is a small boat and four heads of a bull looking inside. In addition to these vases in the excavations done flask shaped pots and jugs with round mouths and high necks were also found. It lies in Kirkdilim Area, approximately 27 km north to Corum. 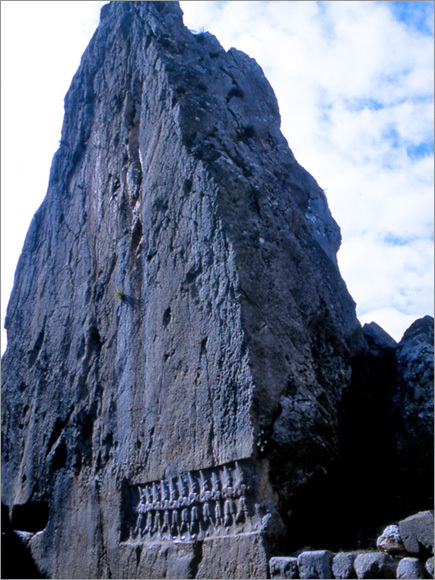 Belonging to Commander Ikezios in Hellenistic Period, the rock tomb dates back to II B.C The rock tomb, which is 65 m high above the stream, has a lopsided podium base. From this podium through a 8 steps stairs one can pass to second platform and from there through 12 steps stairs one can reach to the podium in front of the rock tomb. On the south and southeast outskirts of a 100 m high castle belonging to Ottoman Period, built on a rock in the centre of Iskilip, there are rock tombs belonging to Roman period. Built by Besiktas Warder Yedi-Sekiz (Seven-Eight) Hasan Pasha in 1894 it is 27.5 m high. It has become the historical symbol of Corum. In Corum Castle, which bears the features of Seljuk architecture, housing is existent. It is founded on the south of the province on a high hill. It has a square plan and dimension 80x80. Its height is 7.35 m and the width of the walls is 2.40 m. The gate of the castle is on the north side and there is a big mosque in it. As the castle does not have an epigraph the exact date of construction is unknown. In the construction of the castle, which dates back to Danishmend and Seljuk period, neat hewn stone, broken stone, and gathered stone belonging to Roman and Byzantine periods were used. It was built on 100 m high on three-side rocky cliff. It has a gate facing the North and inside a dungeon on the left. There are battlements all around the castle. The length and the height of the ramparts of the castle, which was built on a high hill, are 250 m and 30 m, respectively. Although it is unknown by whom exactly it was first built, it is believed to be built in Roman Period. In the construction of the walls Horasan plaster was used. There are ruins of a Turkish bath, which was built by carving the rocks within the castle. It was built by district governor, Edip Beg in 1892. Clock Tower, in the construction of which hewn stone was used, has four parts together with base and braid parts. The clock works with the help of a guy and buckets weighting 50 kg. It is believed to be built during the time of Seljuk Sultan Aladdin, by enfranchised slave Hayrettin. After the mosque, which was destroyed in the earthquake during the time of Bayezid II, was restored, it was named Sultan Muradi Rabi Mosque during the time of Murat IV. The epigraph on the pulpit of the mosque, which bears the date of 707 AH, shows that it was built during this period. It was built by the request of Seven-Eight Hasan Pasha at the time of Abdulhamit II, in the place of the old mosque as a token of respect for both the close friend and flag man of Muhammed, Suheyb-i Rumi in 1307 AH. The mosque, which is located in Iskilip district, was built by the father of Islamic scholar Ebusuud Effendi, Sheik Yavsi. In the mosque, which was built as one-domed, there is the tomb of his father built by Ebusuud. Additionally, in front of the mosque, there is a grand elm, which was believed to be planted by Sheik Yavsi himself. During the last few years the mosque is being restored but the basic structure of the building has not been damaged. It is located in Evlik Village, in Iskilip district. In the mosque and the tomb, there are the graves of the son of Aksamseddin, the hodja of Fatih (Nurum Huda) and the graves belonging to the individuals in the family. In the building of the mosque and the tomb wood material was used. It is located in Elvancelebi Town in Mecitozu district. In fact, it is believed to be a small dervish lodge. The epigraph in the mosque part of the building, and the epigraph in the tomb bears the date of 681 AH (1282-1283 CE) and 707 AH (1307 CE), respectively. It is built by Tabettin Ibrahim Pasha Bin Hadji Beg in 1487. Being an Ottoman period monument, the bath is still in operation. 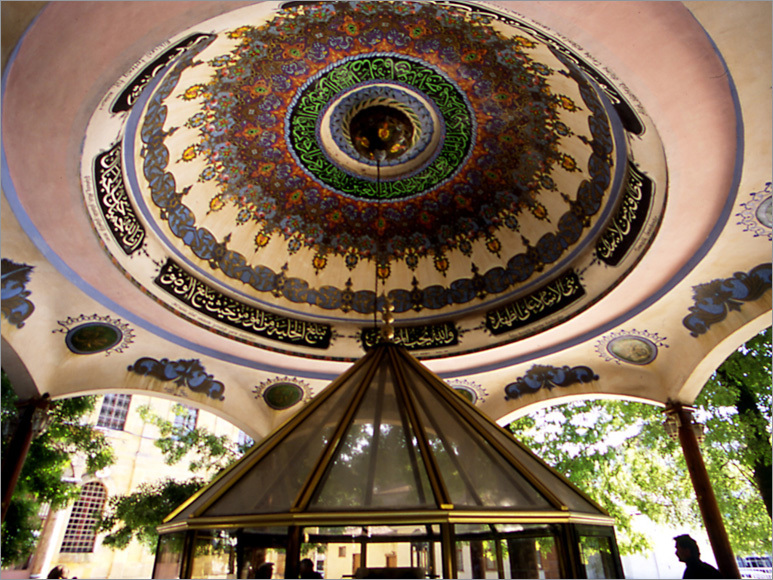 The Turkish bath, which is situated on the opposite side of Ulu (Grand) Mosque, was built in 1436. It bears the architectural features of Ottoman period. Being next to the Clock Tower it is the biggest Turkish bath of the province. It was built by Erzurum Military Governor (Beglerbeg) Ali Pasha in 1573. The Inn, which exemplifies the Ottoman Inns with respect to planning and architecture, lies on a 1000 square-meter area. The wooden inn is a two-storey one, except for the chalet, which is three-storey. It is on the old historical road in Hacihamza Town. Having a rectangular plan it was placed on vaults. Gable roof was vault-bonded. Some parts of the building, which is an Ottoman Kulliye (Complex buildings adjacent to a mosque) with its mosque and Turkish bath, have reached up to now. Locating in Osmancik district the bridge was built by Beyazid II between the years 1481-1491. Being 250 m long and 7.5 m wide it is 15-eyed. It has an epigraph on the north side of the bridge and on the rocky area next to the castle. The bridge is one of the rare artifacts having the features of Classical Turkish Art. 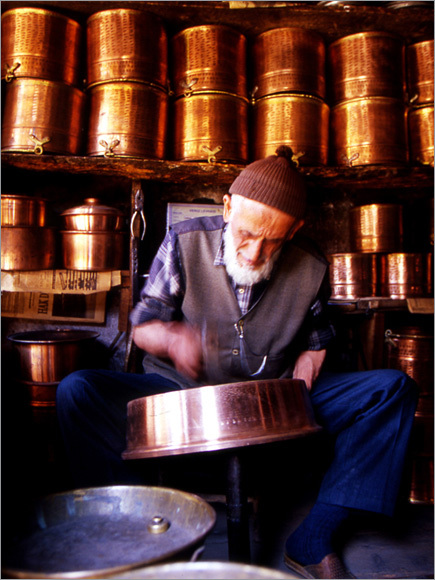 It stands on Kizilirmak for nearly 500 years and still furnishes service. 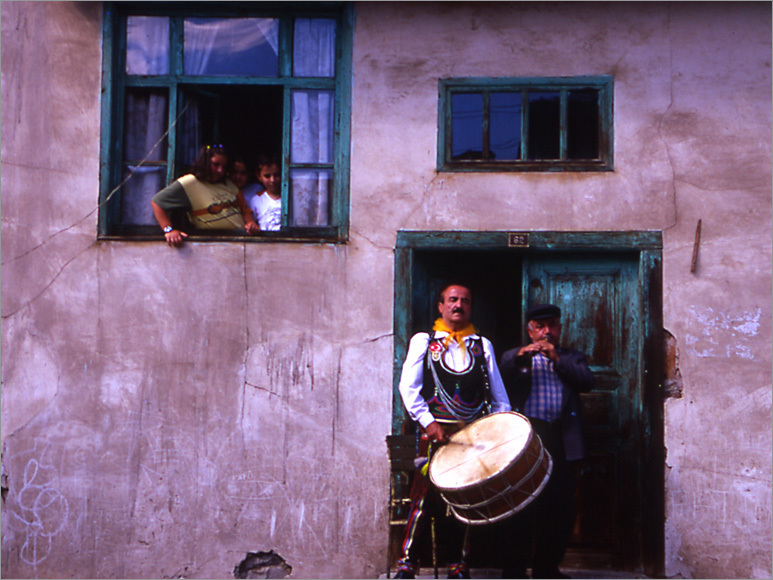 Historical houses of Corum have become a united whole with the traditional structure of Turkish society. One can find these houses in old wards of Corum such as Cepni, Karakecili as well as in Iskilip, Sungurlu, Kargi. 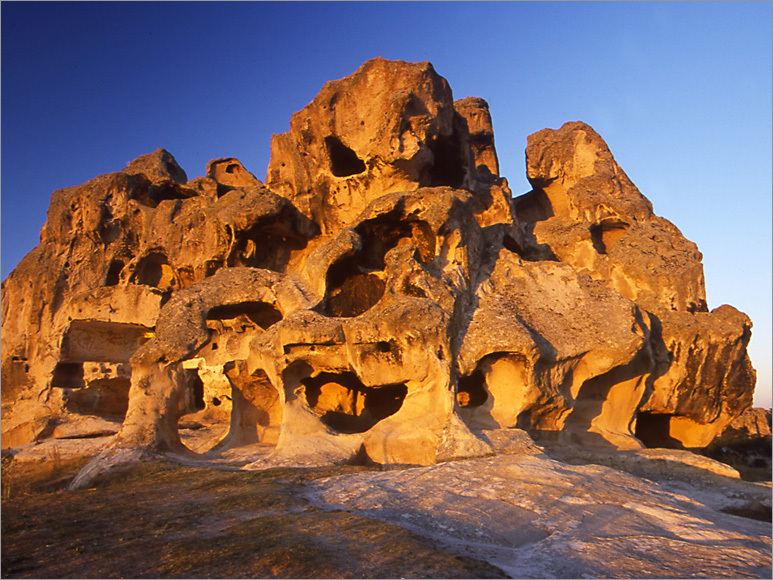 It is located in Bogazkale district. The National Park owes its value to history and archeology. 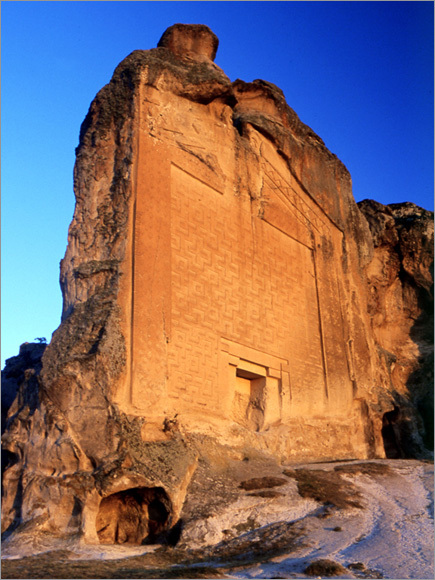 National Park is one of remnants in Bogazkoy (Hattusha), which was the centre for Hittite civilization, one of the most prominent civilizations in Anatolia. Therefore, there are some monuments in the National Park. Ramparts, rampart gates, tunnels, building in Grand Castle keeping archive of the palace and sanctuary are just some of them. Locating 2 km northeast to Bogazkoy Yazilikaya Open-air Enshrine is within the boundaries of National Park. In Yazilikaya, which is known as the first Pantheon in Anatolia, there are relieves of kings, gods and goddesses of Hittites. The most crowded time of the National Park is between May-October. The need of accommodation will be supplied in Bogazkale Villlage. One can reach at Nature Park via Corum-Lacin land road. It is 17-20 km far from Corum. The park fascinates with its natural structure and landscape. In the area black pine dominates as a type of tree. There are a few Scotch pine, too. Fox, rabbit, wolf, songbirds, and partridge form the fauna. Situating on the road to Osmancik this recreational area is 25 far from Corum. It lies on the land road of Corum-Samsun and one can go and come back in a day. It is also close to centre of Corum. It is the source of water for Corum within the boundaries of Kussaray Village which is the central district. There is also a trout production plant there, which was founded by a private firm. Iskilip Elmabeli: It is 13 km far from Iskilip on the land road of Iskilip-Tosya. The recreational area, whose infra-structure was completed by Forest Management, has playing grounds in its body serves for-the day activities of local people such as picnic, entertaining, and sports. It is 13 km far from Iskilip on the land road of Iskilip-Tosya. The recreational area, whose infra-structure was completed by Forest Management, has playing grounds in its body serves for-the day activities of local people such as picnic, entertaining, and sports. The recreational area in Lacin district lies on a high area. It is possible to see the whole valley from there. It is an area covered by pines. It is located in Hamamlicay Village, which is 12 km far from the centre. There are separate swimming pools for women and men. There are 10 private cabins. The temperature of the water is 42°C. The water is believed to cure rheumatism, skin diseases and help breaking up kidney stones. Locating 16 km eastern side of Mecitozu district, around Figani Village, Beke Spa Town has an abundance of water at body temperature. The water boils in a small pool and then transferred to a large one. This spa town is believed to help get rid of the leftovers of metabolism via urine with its diuretic effect and breaking up the stones formed in acidic conditions. Lying on the northern side of Kargi, on a high mountainous area the high plateau is 140 km and 26 km far from Corum and Kargi, respectively. In this area, there are Eginonu, Aksu, Karandu, Gol, Orencik, Karaboya and Gokcedogan High Plateau in connection to each other. In the high plateaus there is still upland house tradition suitable to local upland architecture. With trouts bred in Aksu and Gokcedogan small lakes, which were formed later on, with the flora peculiar to the locale, and abundant water resources these high plateaus are wonders of nature. It is located in Kargi district on Kose Mountain (2050), which is the highest one in the province. It is 114 km far from Corum and 26 km far from the centre of the district. It is one of the high plateaus, which is worth seeing with its undisturbed nature, scotch pine, black pine trees and other flora peculiar to the locale. They are located in Bayat district of Corum, on the mountainous Karatepe Location to the North of the district. It is 100 km and 25 km far from city centre and the centre of the district, respectively. Local people continue with upland tradition in these high plateaus. Especially in Kuscimeni high plateau during summer months tents are set up for camping purposes. It is covered by a rich flora. On the north of Iskilip district there are a number of high plateaus in connection with each other on a series of high mountains covered with a flora peculiar to the area such as scotch pine, black pine, oak and fir tree. Of those Elmabeli-Besoluk and Cicekli High Plateaus which are on Iskilip-Tosya road, and Demirbuku and Yalak High Plateaus, those one can reach if they turn from the eighteenth kilometer on the same route are used widely as picnic and recreational area for domestic tourism. Being 8 km far from Baspinar Town they have their infra-structure completed more or the less. There is accommodation in tents. It is located in Incesu Village in Ortakoy district. Having only one entrance and exit Incesu Canyon is 12.5 km long. Its width changes 40 to 60 meters. Both sides of the canyon are steep rock cliffs and there are forested areas in patches. It bears some features which makes it suitable for canyon rafting and trekking sports. Being famous for its roasted chickpeas Corum is rich with regard to local food culture. Among the traditional dishes mayali (leavened) (sac mayalisi-leavened on sheet, tava mayalisi-leavened on pan), yanic, cizlak, kombe, ogmac, hingal, braided cookie with opium poppy, borhani (with egg, mushroom or paste) helise, cullama, madimak, tirit, dolma of Iskilip (vegetable filled with stuffing), keskek, kara cuval helvasi (black sack halvah), hedik, tetel, has baklava are the most famous ones. Corum roasted cheakpeas and copper stuff, which are the symbols of the province, come first among the things worth buying. Moreover, goods of wood carving of Iskilip, rugs of Alaca Buyuk Camili Village (Village with Grand Mosque in Alaca), rugs, saddlebags, a kind of bootie, socks and hand woven products attract attention. With its different tastes rice in Kargi and Osmancik worth trying.